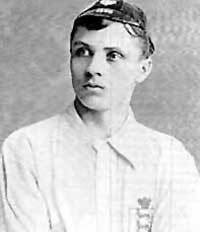 Steve Bloomer was one of Derby county's most outstanding footballers. He moved to Derby as a child from Staffordshire and was spotted by Derby County whilst making a distinctive mark as a player with the Derby Swift team. Bloomer signed for Derby County in April 1892, scoring 4 goals in his first game. He became Derby's leading scorer for 14 seasons and won the first of his 23 England caps in 1895. Described as being 'crafty as oriental and slippery as an eel', Bloomer transferred to Middlesborough in 1906 before returning to Derby in 1910, skippering the team to promotion. After World War 1, Bloomer played with and coached Derby Reserves before ending his career as a general assistant. Steve Bloomer was married and had 4 daughters, two of whom died young. The family lived at 35 Portland Street in the town.